Really great and rare vintage pedal. Made in Japan in the 60's-70's. 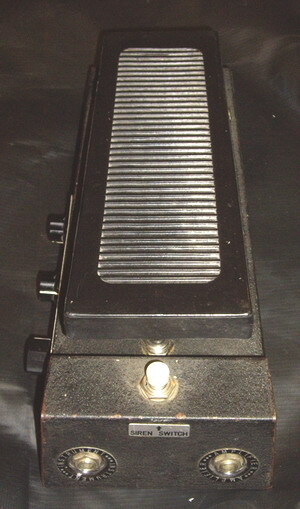 Backwards Wah, with Siren, Hurricane, and Surf effects. Also works as a volume pedal. This has to be one of the worlds first multi effects pedals, containing wah, volume, wind, surf and siren effects!The Wah has a unique sound and response and actually operates in the reverse of a normal Wah! Toe down on the treadle is actually the maximum bass setting and heel down is the treble end of the wah's sweep. Hurricane (pitch controlled hurricane/tornado sounds),volume (normal volume pedal), wah (funky 70s "growl-y" wah sounds! ), surf (like "hurricane" but volume controlled). and the last choice is a switch called 'siren' which is a sine wave rising and falling. 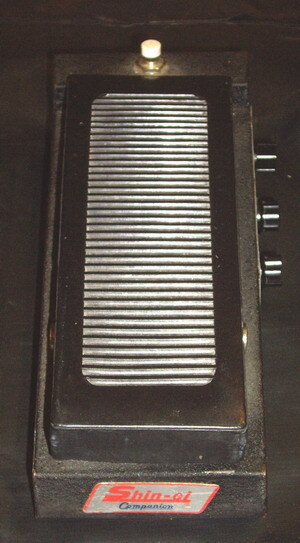 William Reid of The Jesus and Mary Chain famously used the FY-2 and a Shin-ei Companion Fuzz/Wah extensively on their 1985 debut album, Psychocandy.